Please help me win the webcomic WAR! I have joined Frumphs WAR! which is a promotional competition between webcomics. I joined it late, so I’m very behind. This is an appeal to you to help me to win it! •	Tell your friends about this great webcomic you found called Epic Fail at http://epicfail.xepher.net Pop it into twitter or messenger! •	Link to http://epicfail.xepher.net from your website, blog or anywhere on the internet. Even add it to your forum signatures. •	Add http://epicfail.xepher.net to your social bookmarks. There are handy buttons below every post on the website to make it quick and easy. 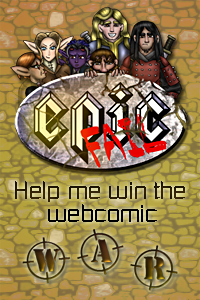 •	Write something about the Epic Fail webcomic. It can be anything, but reviews or interviews are good. It helps if you tell me what you have done. If you have other methods I have not listed to help promote my webcomic please get in touch and let me know what it is.